THE INSIDE SKINNY ON… Seacoast Yoga Mala! This week we chatted with Barre & Soul yoga and barre teacher extraordinaire, Angela Desrosiers, to learn more about a much-anticipated and highly-talked about Seacoast event—Yoga Mala! 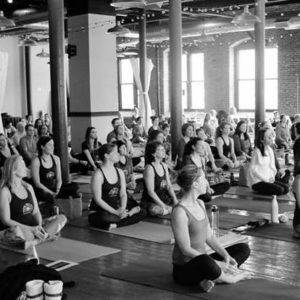 Our team at Barre & Soul is so excited to participate in our first Seacoast Yoga Mala! SATYA is an incredible organization and I feel very grateful to to support them and be a part of the Mala. SATYA (Seacoast Area Teachers of Yoga in Action) provides free yoga classes on the Seacoast for at-risk and under-served populations. Classes include Yoga for Cancer, Yoga for All Abilities, Trauma and Addiction Recovery (and more) and they do so all with the help of donations and sponsors. This is SATYA’s 10th annual Yoga Mala and it’s being held on Sunday, February 10th from 9am-12pm at the Rivermill Landing in Dover. Hundreds of people from all walks of life come together for a day of yoga, chanting and meditation taught by different local instructors. As a community, we flow through 108 sun salutations throughout the morning. While 108 Sun Salutations sounds intimidating, participants are encouraged to go at their own pace (chairs are offered if needed) and there are all abilities participating in this event that welcomes everyone! 108 is considered a sacred number in yoga and there are 108 beads on Mala beads—strands of beads that are used in meditation. Mala beads have been used for thousands of years in meditation as a tool to keep your mind in the present moment. I know with the energy of the community surrounding us, and the love that will be poured into supporting SATYA, this year’s Yoga Mala is sure to be an uplifting and motivating day. To get involved with our team or to make a donation, please check out our team’s page! Learn more about SATYA here! (Above photo by Carol Pescow Rothchild).